This topic contains 31 replies, has 7 voices, and was last updated by tony zambos 4 years, 9 months ago. I’ve had nothing but bad luck with this Leopard electrical system. I’m a weekend warrior with my MY07 and I’m on my second power box stator and coil. The first issue turned out to be the box and later on the stator. I just received my engine back from a local kart shop after a rebuild and I mount it up, hit the button… nothing. Double check, triple check the wires, charge the brand new battery, hit the button… nothing. I pull the starter apart and as soon as the cap comes off I see a starter brush fall out. I get excited thinking this is the problem, so I get a brush kit, put it together and still nothing. I took leads from the battery and touch the starter and it worked so I could eliminate that. I put a test light on the starter lead coming from the power box and it lights up so now I’m really confused. I recheck all of the connections again and when I look inside of the white 4-pin plug I see the female one was deformed. I pull it apart and re-solder the connection and fix the tip of it, put it all together and still nothing. My multi-meter battery was dead so I’m picking one up after work tomorrow, but I’m losing my mind with this thing. It was working just fine when I put it away last season and now I’m getting nothing out of it. Can you guys think of any little tests, similar issues or know what voltages should be on what pins? I have race coming up in 3 weeks and I still need to break in the engine before that. My next steps were to check the fuse in the power box and check for 12v at the starter wire. You saved me quite a bit of typing! I am having exact issues and have gone through the same steps as you. MY09. Havent started it in over 6 months. Pulled carb to do rebuild, All new wiring harness, battery, coil pack, plug, and the new starter only has about 35min track time on it. Turn key and not even a click! Try contacting the shop that serviced your engine. He should be able and willing to help you out. It’s acting as if there was no ground, but I’m assuming you’ve attached the ground wires. Would seen highly unlilkely that both ground wires in the harness are damaged or that the leads from the box to the battery are damaged. Could the battery be connected backwards? Sean, if you have power to the starter and it has turned over out of the engine my guess is a bad section (open circuit) on the commutator/armature. Do a continuity test on each section where the brushes ride from one to another and see if current passes. When you tried it on the engine my guess is it was in the dead spot on the commutator and not letting current flow through. Happened to me many times. Good luck. Tony: I actually re-connected and soldered the main ground going to the engine yesterday. I’m picking up a new ground terminal today since the old one is beat up and to eliminate any other power box ground issues. Saying that, I read this early this morning and got me thinking on the grounding issue. I put friction tape on the frame under the engine mount (same as last year) but the engine didn’t have a change to move and rip the tape yet to make contact with the frame… could that be part of the issue? If the power box is grounded to the engine and the engine isn’t making contact to the frame… there is no ground, correct? It really does sound like a grounding issue, but I ran the exact same setup last year and I did not have one problem. Jim: I will test when I get home. When I pulled the starter apart I actually sanded the armature to the nice copper color to eliminate any build up or bad spots. I pulled the starter apart no joke about 10 from brushes and springs flying out to checking if I did something wrong which wasn’t the problem and I would test it immediately after. Even after I touched power to the starter and it spun I tried plugging right back in to the harness wire and still got nothing out of it. I experienced a similar problem this weekend, except that it happened while I was sitting P2 in the main (arghhhhhhhhh!). Engine suddenly cut out. Coasted off the track. Chain okay. Turned the key to restart and nothing. Brought it back home. Still nothing. Thought maybe I stuck a piston but the motor turns free when rotated by hand. So it is some sort of electrical problem. The battery is strong and the “ground” is there. The Positive is feeding to the key switch and also to the ignition box. There is current flowing to the starter and the bendix meshes with the ring gear and turns fine. I have another starter so I’m going to put it in and see what happens. Don’t see how a bad starter could cause the engine to stop during a race however. I’ll report on my progress. Careful when you put the new starter in. We’ve had a Leopard come in from a session, turned off the engine and found the starter still running. Guessing that if the starter drained enough voltage out of the battery to get below the point where the electronics couldn’t function, the engine would quit. Not sure of the top of my head what the cause was, but it might have been a damaged harness. So, also check your harness for missing insulation from dragging on the ground or where it has been tie-warpped to the frame. Last night: I cut out sections of the friction tape on the underside of the frame so the mount would have a ground, tested 2 push boxes, 2 coils, took voltage reading and continuity tests from both. Sitting there I’m thinking that I have 2 bad power boxes, coils or stators I was ready to sell every piece of karting kit I own. Then I look at the starter and say “the starter sits on the case which is grounded… and you have no ground lead attached, idiot!”. Hooked up a ground lead and the starter spun right up! There was a lot more that could have been wrong with this including the brush that fell off, the orange wire in the 4-pin connector that was deformed, push box ground that became uncrimped, and the friction tape under the engine mount. Jim: #1 check the starter brushes. Mine would not even think about starting with that broken brush. #2 check the ground wire that runs from the push-box to the engine and also the male/female connections on the 3 and 4-pin connections. After scouring the internet for similar problems another person had an issue when taking left turns and braking. Pulled into the pits and one of the wires backed out of the connector. Sean, I always say to myself what’s the most obvious thing to look for when problems arise. Sometimes the obvious sits on our nose and we don’t see it. You are very honest to post this result in this forum. I have did this sort of thing many times and when I think of it my face still gets red. In my case the armature was bad and was caught between poles at times and wouldn’t work. Here’s a link if you ever need 8 pin connectors to replace the stator to harness junction boxes if repairs can’t be easily made to the originals. Yes the wires snapped on me there giving me a prob. I have a new Wiring harness installed, new key ignition, key battery, new coil, and a new starter. Was all working for a track day before I put away for off season. Only thing I did in off season was rebuild the carb. I get no click at ALL when turning key. So I am going over obvious. Where are people attaching the Yellow lead here on the MY09? I have searched internet to find people doing different methods. Use the following link and scroll down to the bottom of the page. There are links to the info sheet /homologation, install guide, parts list, IAME rules and NW Cup rules. 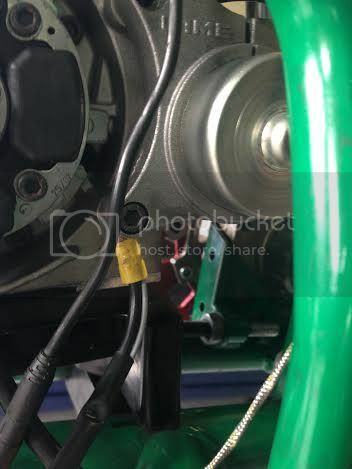 Just a quick glance at the guide; yellow to a bolt on starter, both the braided wire and the red to a bolt on the coil, with the opposite end of the braided cable connected between the coil’s rubber isolator and the motor. That should work, but no dice. This not where it’s shown to be placed per page 16 of the install guide. You said you pulled the starter. Does that mean that you disassembled the starter to check for broken leads to the brushes? Is the battery fully charged? Have all the connectors been double checked? In addition to carrying a spare set of brushes, consider having a second starter. If the one you have now is relatively new, pick up a working used one. Starters can be swapped out in a couple of minutes and you won’ miss a practice session or race. Replacing the brushes is going to take half an hour. External starters would be another option, but believe that’s overkill. Not a big fan of using vice grips on the gear during reassembly as shown in the video. Be careful not to damage it. I had my coil pack sitting too high in place of where my starter ground goes. All fixed now. Pulled starter apart and indeed one of the brushes came loose from compressing the spring. No broken brushes though! Question now: They mention using silicon to prevent the brushes from moving so easily. Hell, ,mine came loose after 10min track time on a brand new starter! Can someone explain where to apply the silicon (where NOT to) and also if there is a specific type you use? Almost ready to fire it up. Replaced starter replay as well. Tony- They just sprung out. Rookie talk haha. Everything in the starter was in great shape. No problems with connections or conditions of brushes. Reinstalled (Patience trying 1st time) the brushes and rebuilt carefully. New starter relay, new battery, new ignition, new coil pack, new wiring harness. Still, Not even a click when I turn the key. Back to the books. 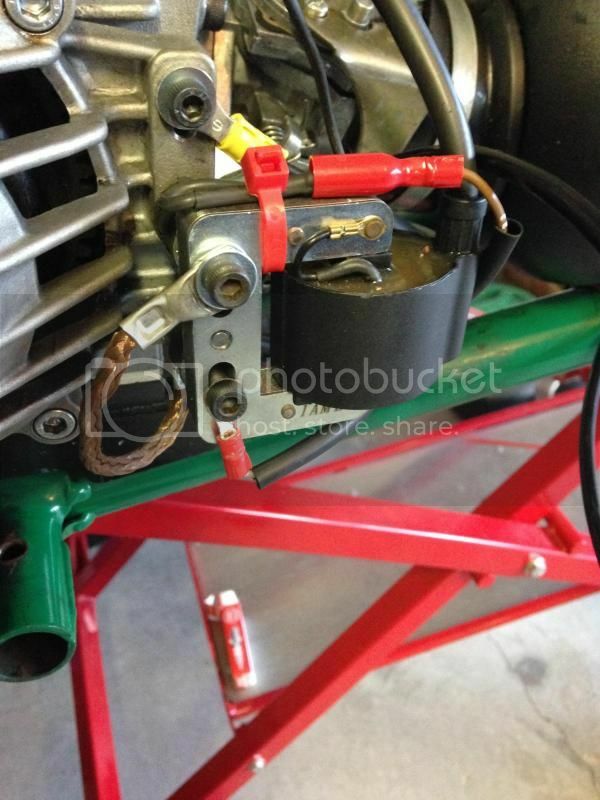 After talking with a friend I originally bought the kart from, he thinks its electrical. If anyone is looking to repair the wiring harness themselves we offer all of the connectors. I do run a full diagnostic on the complete electrical system for $10. Then repair/ replace as necessary. All of the information above is very good. In 80% of the systems I test there is a broken wire somewhere. Find the break is the PITA but then can fix and system is good to go. This is on Power Pack and Digital-K systems. I am always available via phone 888-KARTING to help your issues. All our grounds are correct and hot leads were correct when testing key in ON position. Will install starter back on in morning and go for another shot. Great help everyone. Really appreciate it. Hi, we had the same problem with a MY09 Leopard. Everything was fine one race and the next it would not start off the key. The motor went back for a rebuild and the brushes were replaced at the same time. The motor started off the key on the Dyno but once it got back in the kart it would not turn over on the key. Nothing. No noise like the battery was dead. Because we were racing and busy with life we ran it off an external starter for a few races one of which we dnf’ed after getting spun and we could not restart. I found a wiring diagram of the Italian motors site which was very crude. It basically showed what was plugged into the loom and where the grounds are. It did not show color of wires etc which would have been great. I worked with a multimeter and checked every wire. Finally I tried an old car trick and turned the key to the start position and tapped the starter with a small hammer. Success! It starts! You would think that with as many leopards out there there would be some kind of simple if/then diagnostic reference and a color coded wiring diagram so we can figure out what parts to eliminate when they don’t start as opposed to having to randomly buy expensive parts in a process of elimination. Not saying this is the cure for anyone else’s problem but it’s worth a try if you know your brushes are good, your battery is charged up, your grounds are connected and right before you sell everything to participate in a cheaper sport like polo. Glad you’re still having fun. What you need is a buddy with a working starter on his Leopard. Take the entire starter and bendix off of his engine and put it on yours. That’s only six screws. If you plan to continue racing a Leopard, purchase another starter assembly. That’s a starter motor, bendix and supports brackets. At that point, swapping out a starter is quick work. Have done one on the starting grid before the green flag fell. Have you ever moved your ground wire to the screw that runs into the starter motor? Figure #23 in the manual. Relocated ground wire, yes. My plan was actually to keep this as a back up and order a fresh one. Unfortunately I do not believe you can buy the armature alone. Ordering a new one this weekend. On side note. How often should an engine vibration plate be replaced? I am still amazed these starters are so problematic with the engine vibration rattling their insides apart! Still beleive that borrowing another starter is your best bet to see if a starter is your problem. Having a spare starter is a good think to have. 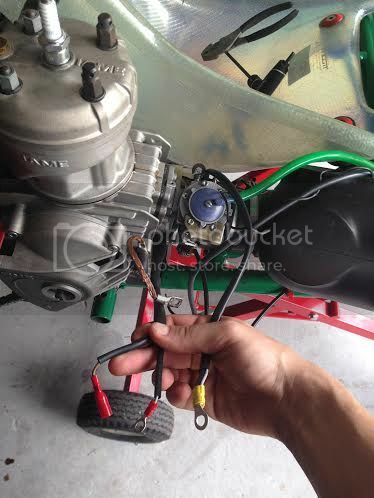 Have you ever tried running a jumper wire from the battery to the starter terminal? No experience with the vibration plate. Bought our engine used and it didn’t have one. Don’t recall ever seeing one being used and I don’t think we had any more starter problems than anyone else. Will keep this updated next week. It’s been awhile, but I’m confident that there isn’t a ground between the Leopard electrical system and the chassis. Even if there is no continuity between the engine and chassis, the chassis has four insulators called tires. The ground is only relevant to the circuit it’s a part of. For instance, if you apply 12 volts to the starter, nothing will happen until a return path, the ground, is established back to the battery. I have never tried this, but in theory, you should be able to have continuity between the engine and the negative battery lead. I’d remove the leads from the battery before trying this and this might not work if the control box is switching the ground and not the positive to the starter. Better yet, if someone has tried this, maybe they will post their results. When I connected the ground, I always used a star washer between the ground lug and the engine. Haven’t seen Jim Russell on the forum for a long time now. Maybe if he’s monitoring the Forum, he could point you in the right direction. Or, and the better way, you call Russell Karting. The following link is to the site and click on the contract page. Installed here in between the starter bracket. What you think everyone. Dice or no dice? Pulled starter before and nothing seemed broken. Only has 30min on it. Sean- Glad it worked out. Before I pull mine and disassemble, I still want to rule out all ground issues. Only have the weekends to work on it. Tony- Relocated. Still no click at all from key. If its not the ground, its the starter for me. So working on the starter myself will be a first! Its only got 4 starts and 10min track time! crazy! Sorry, one quick video that I will be following this weekend for sure when inspecting the starter. Great for future rebuilds too!